Taking care of your skin is the most basic, essential way to combat the visible signs of aging, heal acne and fade skin discoloration. It is never too early or too late to begin a comprehensive skin care routine! At Ocean Plastic Surgery Center, Dr. Aiello and his experienced aesthetics staff have the knowledge and expertise to recommend the best in clinical skin care products. Whether you are just starting to think about a skin care routine or are in the crucial post-procedural-care stage of a chemical peel or laser treatment, we can talk to you about what your skin needs. Call Ocean Plastic Surgical Center today for a skin care consultation, and let us create your customized skin care plan for you! SkinMedica products have been developed by biologists and other clinical researchers for nearly 20 years. Their products are formulated based on research and clinical data. Instead of providing quick fixes, SkinMedica products offer long-term health benefits for your complexion because they work deep within your skin, not just on the surface. 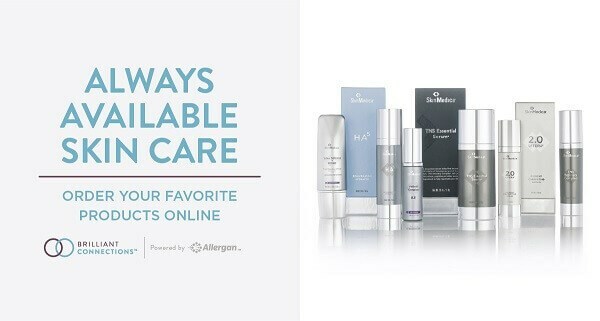 Ocean Plastic Surgical Center does stock some SkinMedica products in the office, but our recommendations can also be ordered online with FREE 2-day shipping! SkinMedica also offers discounts on product subscriptions and you are rewarded Brilliant Distinctions points for your purchases. Developed by Allergan, Latisse is a treatment for hypotrichosis (sparse or too-short lashes). FDA approved since 2008, Latisse appears to increase both the duration of the lashes’ growth phase, as well as the number of lashes via its active ingredient, bimatoprost. It is meant to be applied to the base of the eyelashes each night before sleep to increase their fullness and length. If used as instructed by your physician, Latisse can provide visible growth results in only a month’s time. Latisse is a prescription-only treatment and requires special discretion if you use any medication for eye pressure conditions. If you’ve been frustrated with the length or volume of your lashes, schedule a consultation at Ocean Plastic Surgery Center today to see if Latisse is the right product for you.